Clearly upset with Ferrari’s use of team orders in Shanghai, Charles Leclerc says he accepts it after meeting with his Scuderia bosses following the grand prix. 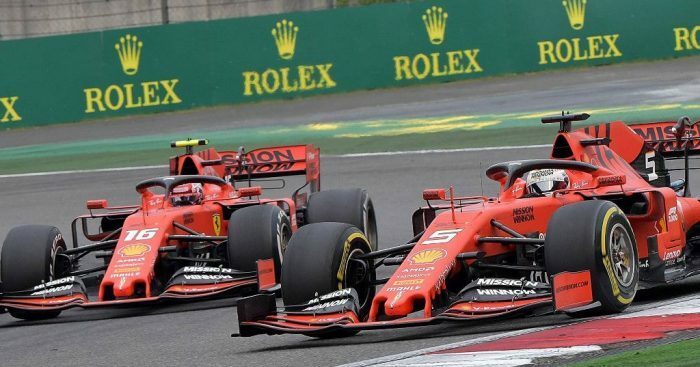 Leclerc was frustrated with Ferrari during Sunday’s 56-lap Chinese Grand Prix as he felt team orders favouring Sebastian Vettel was unfair. Running 3-4 in the early part of the race with Leclerc in front of Vettel, the Monégasque driver was told to “go faster otherwise we will let Sebastian pass”. Leclerc, though, was unable to up his pace resulting in the team order being issued. “Let Sebastian by, let Sebastian by” came over the radio. He did just that and while Vettel put metres between the two Ferraris, he by no means scampered off into the distance. Laps later Leclerc told Ferrari that he was “losing time” behind his team-mate, adding “I don’t know if you want to know or not”. Vettel finished the grand prix on the podium while Leclerc, compromised by the team orders, was P5. The Ferrari rookie met with the engineers and bosses in the wake of the race and now says he accepts the call. “Obviously we had the meeting,” Leclerc said. “It was not an easy situation. “I was obviously struggling with the tyres, we both were, and at the time it just felt like Seb was quicker. “But obviously being behind me for some laps he also damaged his tyres and when he went in front his tyres were probably also damaged. “Being in the car it was a bit frustrating but, on the other hand, I’m well aware that being in the car you don’t see much of the full picture of the race.